Many recent studies have ended that today’s young adults face a tougher economic environment than their parents undertaken. Debt, unemployment and property prices make it harder for this generation to buy a home in 2017. If you are in a position to help a close friend or relative, this blog post will show you numerous ways you can raise his or her home-buying power. 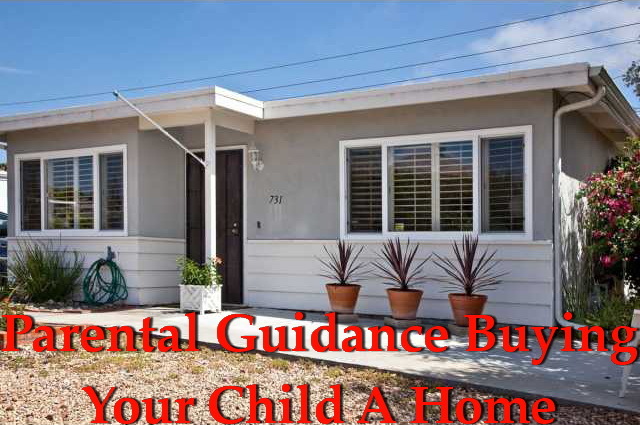 Parental Guidance Buying Your Child A Home in 2017. NSH Mortgage has the knowledge and tools to help you understand for 2017. Mortgage applicants with higher FICO scores pay lower mortgage rates. With better credit, they may qualify for higher mortgage amounts or make lower down payments. It is a challenge for young adults to attain an excellent credit score. This is because it takes time to develop a credit history, and this history is the most influential factor in the FICO credit score calculation. If your own payment history is good, you can help your child by adding him or her to one or more of your existing accounts. This is called adding an authorized user. Credit bureaus then connect your beneficial payment history to your child’s credit report. This can enhance a score quickly. Another factor that affects younger homebuyers trying to buy a home in 2017 is reserves. Reserves refer to the amount that the borrower will have in their savings after closing on the property. In other words, how much money will be available to pay the mortgage if income is interrupted? Applicants with more reserves appeal to underwriters. Add your adult child to a savings account or two, if you are comfortable doing so. Reserves can push a borderline application from deny into approve. Add your adult child jointly to your savings a few months before he or she applies for a mortgage. Mortgage lenders often want to see two or three months of bank statements to verify an applicant’s assets. You will probably also have to write a letter stating that your child has access to and ownership of the funds. Most mortgage programs, including government-backed loans like FHA, do not require home buyers to make their down payments out-of-pocket. Fannie Mae and Freddie Mac also offer loans with no minimum borrower contribution. They allow you to gift your child’s down payment but, to make a gift work, you must first prove that you have the money to give. For example, you would provide a statement from your account, showing the money is there. Next, you must either pay the money directly into the escrow account or into your child’s account. Keep copies of all canceled checks, wire transfers or other documents. Finally, you will need to draft and sign a gift letter. The letter must state that the money you provide is indeed a gift and that repayment is not required. It is better to be a co-borrower than a co-signor. As a co-borrower, you are obligated by the mortgage. However, you also get ownership interest in the house. Co-signors, on the other hand, own none of the property. What they do get is what is called contingent liability. They can be forced to repay the loan if the borrower defaults. Co-borrowers with good credit, stable income or substantial assets can strengthen a new home buyer’s chance at loan approval. Before giving your child money for a home purchase, verify the tax consequences of doing so. Since, gift taxes and other penalties could apply if the amount gifted is large enough. Adding your child to an account as an authorized user is an act of trust. You are giving them the right to use the available credit, without any repayment obligation. Likewise, with adding your child to bank accounts, joint ownership means that either party can withdraw all the funds in an account. If you choose to co-purchase with your child, agree in writing beforehand who pays for what and who owns what.